Mt. Corcoran, an SPS peak on The Sierra Crest between Mt. LeConte and Mt. Langley, has four distinct summits (more if you count smaller outcrops) that have collectively been referred to as Comb Ridge. All are over 13,600ft in height and form a difficult, sawtoothed ridgeline. The northernmost point is the highest and is marked as Mt. Corcoran on the topo map. The next point to the south is Sharktooth, today's main objective, and the two points further south are referred to here as Middle Tooth and Tuttle Pass Peak. A traverse of the four summits was first done by Galen Rowell in 1970 but it never became a popular route due to the long approach and difficult route-finding. Secor's guidebook has three pages of route information on Corcoran, but much of that describing the route we would take today was inaccurate. Our starting point would be the Tuttle Creek TH, one of the few East Side trailheads that had not been used on a previous Sierra Challenge. This would be an entirely new approach for me and I was very much looking forward to it. The last half mile of the road to reach it is very rough and only the beefiest of vehicles can manage it. In our case, this was Alberto's FJ Cruiser and Michael's Nissan Pathfinder. Our starting crew totalled only seven today, so the two vehicles sufficed. Despite the tricky drive, we were there with enough time to make the usual 6a start time, right at sunrise. There is a very good trail that goes to the stonehouse ashram, located a mile in from the trailhead. I know little of the history of this unusual building, apparently built as a spiritual retreat decades ago. It has fallen into disuse and disrepair, though some efforts at restoration can be seen, but these too, seem to have been abandoned. The construction is of very good quality and the stone walls look almost as good as when first built, but the roof and interior have not held up quite so well. We spent about five minutes exploring the building, photographing it and reading some of the inspirational messages found there. Afterwards we returned to the trail and continued up the canyon. The trail held out for another hour, longer than we had guessed it would. It thins considerably in places and we lost it a few times, but for the most part we were able to follow it to the 10,000-foot level. Periodic ducks appeared above this and continued across some boulder slopes, but they weren't all that helpful as the route was fairly obvious. A creek crossing was made trivial with the help of a large log that had fallen conveniently across the watercourse. We continued up more open slopes as the forest gave way to alpine terrain and the usual preponderance of rock. By 8:45a we had gained a shelf just below where the canyon splits in three. A lone tree here provided welcome shade while waiting for our party to reconvene. Just above here the main canyon continues up the center to Tuttle Pass. Alberto would take the southern fork to Mt. Langley while the rest of us took the northwest fork heading up to the east sides of Mt. Corcoran and Mt. LeConte. This fork goes steeply up some gleaming granite slabs with a picturesque creek cascading down the center. We stuck to the left (or south) side of the creek on the ascent but found the north side a little easier on the descent. Higher up in the canyon things got more tedious. Really tedious, in fact. The canyon splits again and it was here that Michael would take the northern fork to reach Mt. Corcoran's highpoint, his goal for the day. He was behind the rest of us at this point so we never saw him until we were back in Lone Pine, but we'd find his boot prints in the snow when we descended that way hours later. Meanwhile, five of us continued up the left fork, aiming for the notch between Tuttle Pass Peak and Middle Tooth. After much boulder hopping up the moraine, some of it the size of small cars and others unstable and disquieting, we got to the edge of the snowfield leading up to the base of Comb Ridge. Here we paused to discuss the route ahead. For some reason, one that had no basis in the beta collected beforehand (or afterwards), I thought getting up to our intended notch would be a straightforward class 2-3 effort. Not so. The couloir was terribly steep with potentially unclimbable sections, partially filled with snow and sporting a gaping 10-foot bergshrund at the bottom. I tried to stay positive and poo-poohed any talk of serious concerns, saying it would look much better when we got closer. But of course there were serious concerns. Serious enough that I thought there was a chance we wouldn't make it up to any of the summits. We would at least have to give it a try, so after putting on my crampons, I led the way up the snowfield, Tom close behind without crampons, and the other three a few minutes further back. Upon reaching the bergshrund, we moved to the left side where a rock face looked to offer a way around it, and so it did. Tom went up first while I was taking the crampons back off, taking a direct route up the rock while I scouted and found a slightly easier, but more circuitous route to the left of his up a series of ledges. After about 20ft we moved back into the main chute above the bergshrund. We then moved slowly up the left side moat along the edge of the snow for another 30-40ft until it became more difficult. Once again, we took different routes, Tom staying left on low class 5 rock while I went back to crampons to cross the snow to the right side where the terrain was somewhat easier. The other three, meanwhile, were slowly making their up as well, all of us cautious and moving with very deliberately so as not to make any mistakes. Where the snow had melted out of the chute higher up, loose material covered all the rock, adding an additional concern of rockfall. Tom and I were the first to reach the top of the chute to the notch, the effort having taken about 45min. The others were probably about 5-10min behind at this point as Tom turned briefly to watch their progress. Should we wait? I wanted to visit Tuttle Pass Peak to the south as a bonus and Tom seemed equally inclined. We didn't know if the others were equally interested, but figured we'd either see them make their way up behind us or we'd play catch-up heading north to Sharktooth. What seemed like it would take us about 10min took us half an hour as we found the route to Tuttle Pass Peak both longer and more involved than it first appeared. The summit has a fine view of Mt. Langley's North Face to the south and the broken but reasonable-looking South Face of Middle tooth to the north. We could see the others starting up to Middle Tooth already. They looked very far away. We found a register consisting of three loose sheets of paper, dating to the 1990s. Peter Croft's was the only name I recognized among the handful of parties visiting. We reversed our route back to the notch and then headed up to Middle Tooth, taking a full hour between the two summits. The others were nowhere to be seen, having already started down the other side for Sharktooth. As there was no register to be found on Middle Tooth, we left one and added the names of all our party before going off to chase them down. Secor mentions dropping 300ft on the south side of the crest at this point, which turned out to be accurate, even though I still took some time to explore a more direct route over an intermediate pinnacle between Middle Tooth and Sharktooth (it looked like hard class 5, so I gave it up quickly). 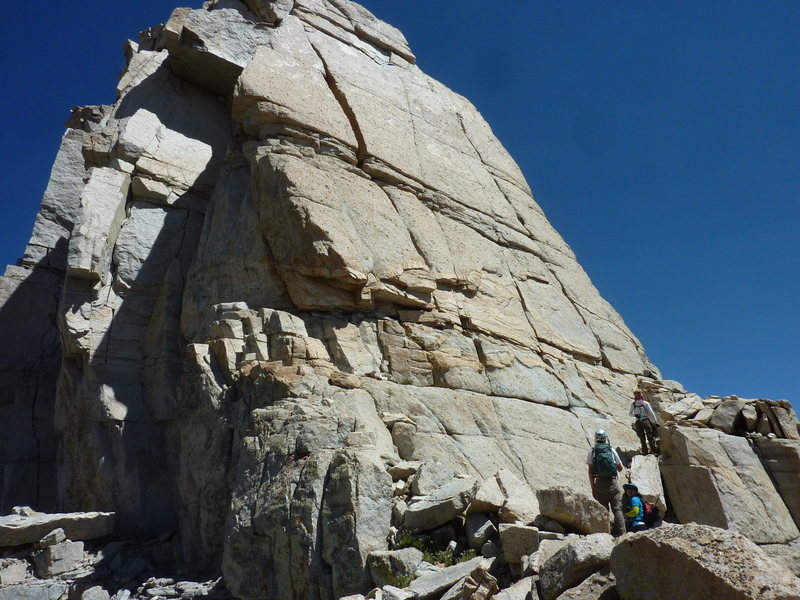 A large chockstone high in the chute dropping west from the notch makes it difficult to access the chute directly. Instead, one has to wander down steep slopes for maybe 150ft before being able to drop into the chute and continue down the remaining distance. We caught sight of the others as they were going around the corner while Tom and I were still making our way down the steep slabs. These boys were not easy to catch. We had heard JD exclaim that he'd found the key ledge system around the corner and watched the others disappear as they followed him. Secor describes the traverse into the adjacent chute as a class 4 affair, but we were surprised to find it rather easy class 2, a world of difference. The adjacent chute turned out to be no big deal either (class 2-3), and by 2:20p Tom and I had joined the others at the base of Sharktooth's impressive West Face. Here we expected to find a class 4 route as mentioned by Secor, but there seemed to be no obvious route that would qualify for anything close to that, even by California standards. The other faces were near-vertical to overhanging and only the West Face seemed like it had a reasonable chance - but where? JD and Robert explored a long, 30-foot hand crack running up the right side of the West Face. JD climbed perhaps 10ft of this before backing down. Tom and I were putting on our climbing shoes before joining in the hunt, while Matt took to filming the escapade and seemed content to have gotten as far as he had. I went over to look at JD's crack and quickly dismissed it. Robert said the South Face looks a little easier on face climbing but terribly exposed. I looked at that, too, before laughing that he was out of his mind - it was nearly vertical. Tom spent a few minutes exploring the base of the North Face before coming back without any good options there. Eventually we settled on a crack/chimney combo on the left side of the West Face as the only reasonable route that we were going to be able to manage without rope and gear. Tom went up to the start of the 15-foot off-width crack and headed up. In a few minutes he had transitioned into the 15-foot chimney directly above it, continuing to smoothly make his way up. He was making this look so cool and easy that I naturally gravitated to the start myself, not wanting to be left behind and thinking maybe I could do this. I paused at the start of the crack to see how Tom managed the exit from the chimney where it ends near a small ledge. Tom paused here the longest, perhaps a full minute, before executing a very reachy move with his leg onto the face below the ledge and mantling his way onto it. He then walked himself around the corner on this thin ledge, commenting about the route as he went though half his words were muffled behind the rock face. I got the sense that the extra time he was taking meant the route would go and started up after him before I lost my nerve. I grunted and oofed my way up in an altogether unpleasant-looking style that befits my age and abilities, Robert starting up 5-10ft below me and finding my mannerisms somewhat amusing. His were more like Tom, cool, collected and cozily reassuring. At the top of the chimney I found a way to scrunch myself higher inside before stepping out onto the 4-inch ledge. Thank God the face sloped inward or I would never have been able to walk along it. The ledge moves around a sharp corner where it become a more comfortable width and presents one with a 10-foot open book to surmount. This seemed far less exposed and gave me a chance to calm myself even while grunting up this problem. From the top of this, one moves left over some chunky blocks to find a last mantling problem to easier ground. Tom provided more coaching for this, and within about 20min we were up. Success! At least partially - we still had to get down and I would remain nervous until we did. JD had started up the off-width before deciding not to follow us. I can't help but wonder if my poor execution didn't help sway him. I suspect if just Tom and Robert had gone up, JD might have felt far less disinclination to follow them. Once we realized no one else was joining us, we walked the remaining 30ft of so up the inclined ramp to the summit where we took a few photos ( south to Langley and north to Corcoran). We found no register and I had left my remaining one back with my pack - a tactical mistake, but a minor one. We then went about reversing the climb in the same order - Tom first, myself second (I would have been extra nervous going either first or last), Robert bringing up the rear. In about 10-minutes' time we were all safely back down, breathing a collective sigh of relief and changing out of our climbing shoes. Phew! The others would get back to the TH about an hour and a half behind Tom and I. JD and Robert had been unable to find a way up to Corcoran from the south, retreating down from fifth-class terrain and eventually descending the same chute we had used. The three of them would have to walk the extra half mile to the 2WD parking lot down the road. Alberto had gotten back from a successful climb of Langley around the same time as Michael and had soon after driven back out. Mason and Iris had made it LeConte from the Meysan Lakes TH, finishing the climb in under 13hrs. Interestingly, we had climbers on all six of the major summits between LeConte and Langley today. Matt's Video, climb of Sharktooth starts around 13:00. Great job summiting that one Bob! Definitely looks harder than Secor's Class 4- how would you rate it? I think the consensus was something like 5.5-5.6. Noticed Dan Arnold's name on Page 2 and 3 of the register here. I do not know him, but he wrote a wonderful book "Early Days In The Range Of Light" (2009) that many of your readers and fellow mountaineers would really like.